Introducing the Muddy-Footprints Sponsored Riders…. It’s 2018 and what a time to announce our Sponsored Riders! We were absolutely overwhelmed with the response to our advert! (We received over 700 sponsorship applications!) It was such a hard decision, but we managed to narrow it down and choose our 18 Muddy-Footprints Riders! We are very much looking forward to working with each and every rider this year. 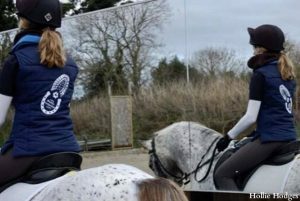 Make sure you look out for our logo on their clothing/saddle cloths (& even on lorries) while out and about at Dressage, Show Jumping and Eventing. Firstly, we want to thank all of our sponsors for an amazing end to 2017! We are so pleased to have you on board & cannot wait to meet you all! So, here’s what you are waiting for…. 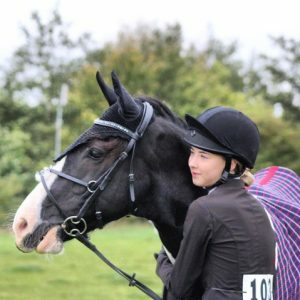 My name is Jessica Coombes and I’m a young Event rider based in Dorset with my two horses Clouded Leopard aka Oliver and Blazie Boy aka Bambi. My horses are my world and eventing is my dream. I have such a passion for the sport and I’m excited to move up the grades with my horses! 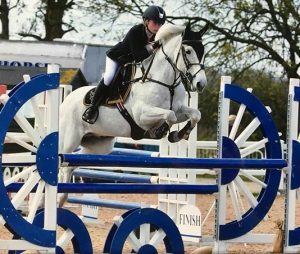 Clouded leopard who is a 16.2h Irish sport horse has had experience at 3* level and Blazie Boy who is also a Irish sport horse but he’s 17h has had experience at 2* level so I have some exciting times ahead and have already competed up to 1* with both! 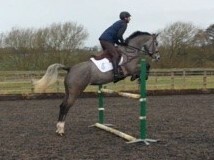 I do also have a project horse called Grey Shake aka Mickey, a 15.2h Connemara x on the yard. He currently competes at BE90 level, I’m looking forward to competing him and having lots of fun! I see my horses as my best friends. They all have different personalities and cheeky things they do to make me laugh each day. Oliver and Bambi are like two peas in a pod. They are actually like a mirror image of each other! Both big bays with one white hind foot! I’m hardworking, dedicated and definitely ambitious! Eventing isn’t just a hobby for me it’s a lifestyle! I’m so excited to be part of the Muddy-Footprints team, bring on 2018! I am a 19 year old young rider on my gap year. I have a small string of 4 horses (currently) who I mainly do dressage and Eventing on. My smallest (and oldest at 23) is my first pony who I still compete unaffiliated doing and winning a bit of everything. My dressage pony is 14.2 ex FEI event pony. She is partially sighted in her left eye which makes her very spooky, however we still managed to compete BD up to elementary and unaffiliated up to medium. We are almost ready to have a go at our first advanced medium she just finds the flying changes a bit too exciting! 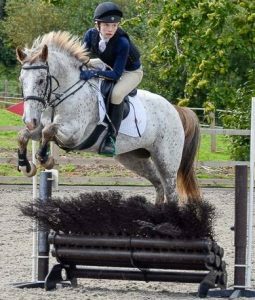 Lara my grey mare is my event horse, we have competed up to CCI* being selected for the south east team for the CCIJ* at Weston park in 2015. This was only my first season with Lara and my second season ever so we were very proud to complete. And Lastly I have JJ my unbroken 3yo who I will break in and bring on over the next year. I also run a livery yard with my mum and take on schooling liveries alongside some freelance riding. 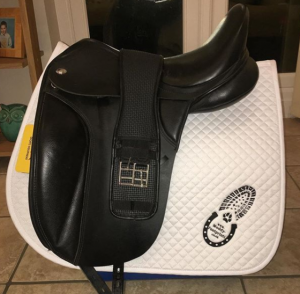 Alongside all my riding, me and my family have a very country lifestyle with our two dogs meaning between we can try and test all of Muddy-Footprints fabulous products! My name is Libby Alvis, I’m 13 years old and Event in the South West! I have a 16hh Irish sports horse called fly,who I have recently got, we are aiming for BE90 next season and to compete 90cm with the NSEA. 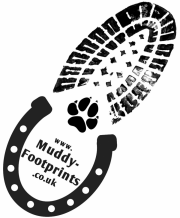 I am so pleased to be sponsored by Muddy-Footprints as it opens up a wide range of opportunities! 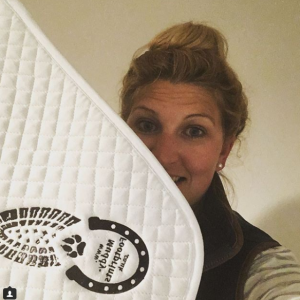 If you would like to see my journey with fly then follow my Instagram @_LA_eventing and see what my Muddy-Footprints products get up too! I’m Charlotte a 28 year old amateur eventer. I live in the new forest with my long suffering husband who has learnt that he comes way below the horses and the dog in the pecking order! I have one horse who I event and another semi retired. JKs Topgun has qualified for the Badminton Cup next year at BE100 level which we are super excited about! We have been been competing up to Novice level which we will continue with after badminton with the hope of completing a couple of CIC1*s by the end of the 2018 season! I keep Ollie at home with my parents which has direct hacking into the forest however I have no other training facilities at home which can prove tricky for event prep! Sometimes Ollie does nothing but hack between events which makes our achievements all the more impressive! I can’t wait to have Muddy-Footprints supporting me for the 2018 season, fingers crossed we get some great results! My name is Sophie and I was 6 years old in September. I live in Bury St Edmunds, Suffolk and go to All Saints Primary School in Suffolk. I have been riding since I was 2 years old and my first pony was a little palomino Shetland called Peanuts. 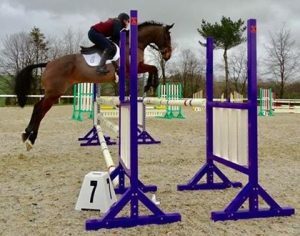 My parents bought Harribo for me in March this year as I love jumping and he is a jumping pony. He is liver chestnut and 11 years old. At 12.3hh he is too big for me at the moment and he can jump the jumps quite big even when they are small, so I have to be careful that he doesn’t jump me out of the saddle. We tend to do the smaller classes at shows, anything up to 50cm but nothing bigger. This winter I am trying to go to shows most weekends on Harribo so that I learn to ride him properly and practise remembering the courses on my own. There are also some pony club rallies coming up over the winter with the Suffolk Hunt Pony Club that I have been a member of for the last 3 years. I am also a member of the NSEA and competed for Lawshall School coming 5th last September and qualifying for the grassroots regional championships next year. On my old pony I did a lot of x country and a couple of One Day Events. I haven’t done this on Harribo yet but now that I am starting to ride him all the time I am hoping to do a lot more of this next Summer. I have been very spoilt on Harribo already as the last two shows we have been to he has won his class. He can be a little grumpy but I do love him very much and can’t wait to grow into him properly. 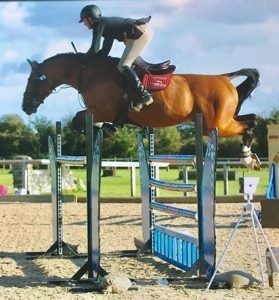 I’m Alice Williams, I’m a 19 years old from North Wales and I compete my 9 year old 16.3 Belgian Wwrmblood gelding Joey in British Showjumping. So far we have competed up to 1 metre but we are working up the ropes and hope to continue to progress up the heights, in the ring Joey really knows his job and puts his competition head on, whereas at home, he is a complete dope on a rope and can even be ridden tackless! I am very excited for this amazing horse’s future and even more so now that we can represent such a wonderful company! 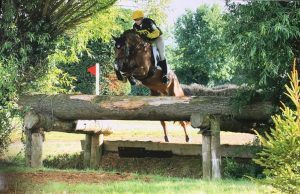 I am a 19 year old event rider based on a small farm in West Sussex. I compete on behalf of some amazing owners and enjoy producing young horses up through the levels. 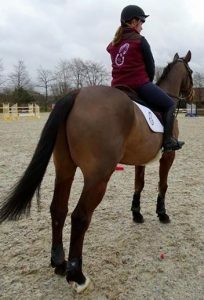 I am currently riding at BE intermediate level (on a self produced horse) with which I am aiming for 2* on next season. 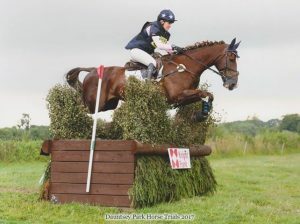 This horse has previously been selected twice to compete on the Junior 1* squad at the U18 championships, where we went clear on both occasions around the cross country. 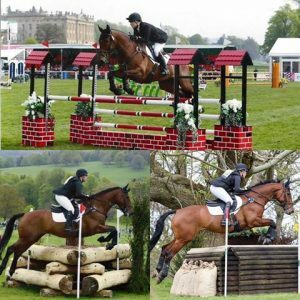 I started up my business, Durkan Eventing Limited, at 15 years old and my future ambitions are to be competing at top level in Eventing, whilst continuing to break in and produce young horses. I am very much looking forward to working with Muddy-Footprints as I believe it is an exciting new company offering a diverse, yet affordable range of products! 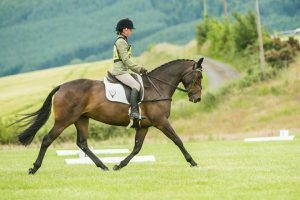 My name is Louise, I am a 27yo event rider from Kelso in the Scottish Borders. 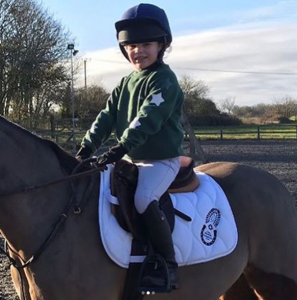 I am lucky enough to have a lovely yard on our family yard and have great facilities where I am able to run my business from which is taking horses in for schooling, educating and competing as well as compete and train my mums and my own horses. I currently have 4 horses that I am competing, my main horse is Boo Diddley, she is our homebred 8yo. I have produced her myself, this season we completed Badminton Mitsubishi Motors Cup BE90 finishing on our Dressage Score for 17th Place, the Scottish Championships at BE100 level where we finished 7th and finished the season completing our 1st Novice Event. Next season she has qualified for Badminton again but this time for the BE100 and we will hopefully get a few novices in too. Bumble is our other homebred, he is a half-brother to Boo, we have taken it very slowly with him as he is a large 5yo TB who is still growing into his body, we are starting to ask him some more questions and hopefully will have him out eventing next season and quickly stepping up the grades, but only when he is ready. He has had a few outings and this will increase over the next month. He’s done some dressage, showing, Show Jumping, Hunter Trails and has had his 1st day hunting this week where he was very good. Coco is my all-rounder but can be a bit of a madam. She has won Dressage, Show Jumping, Eventing, Working Hunters, Riding Horse, Side Saddle, Team Chase’s and Hunt races and also loves her hunting, she really does do everything as long as she is in the right mood. 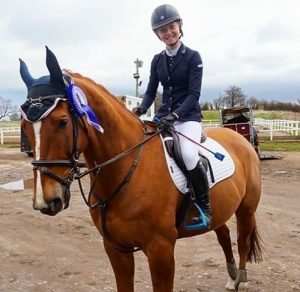 She attended the Riding Club Novice Winter Championships for Dressage and Show Jumping last year and has qualified for the Dressage Championships again this year. I am hoping that we will get her out to a bit more eventing next season as she has great ability but sometimes doesn’t want to go cross country. There is always plenty of other things that she can do. Daisy is a lovely mare who after being backed went into training, she sometimes struggles with keeping everything settled and calm, but when she is she is lovely, she has a great jump in her and moves nicely, I am working on her currently to get her settled in and out of the ring and if we can crack that then we will be out eventing next season and I can see her stepping up the levels successfully. I want to thank Muddy-Footprints very much for this opportunity and support and I hope I can do them proud, I’m really looking forward to getting out and about with their numnah and to get recommending them. 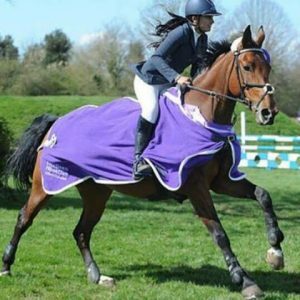 My name is Sophie Coles, I am a 17 year old British Riding Club events rider from the East Midlands. 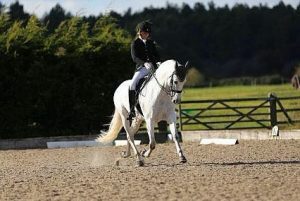 I have had the pleasure of owning my 15.2hh Irish Draft x Cob – Charlie, now for 22 months who I compete on regularly. At first I didn’t plan on competing Charlie when he arrived over from Ireland as he turned out to be an unexpected project, however with lots of work and love, he has really shown a love for his work. 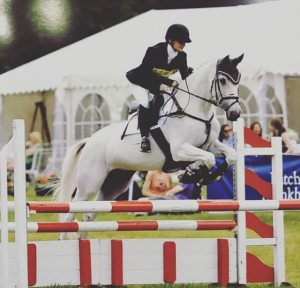 We compete in all disciplines such as showjumping, cross country, hunter trials, dressage and even the odd bit of showing which ranges from local shows up to qualifiers and championships. 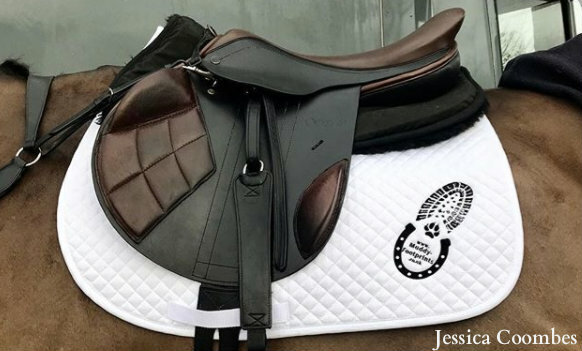 We look forward to competing in 2018 and sharing with you this years journey which you can also keep track of over on my Instagram where we post daily uploads on things we get up to – @Justmycob. We hope to successfully achieve as much as we did in 2017 with the help and support alongside of Muddy-Footprints. 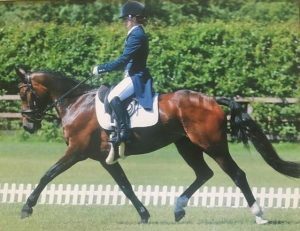 I am Stacey, a 31 year amateur dressage rider, as well as working as a Development Manager for a large international coffee company. I started riding as a 2 year old, on my grandfather’s 17hh hunters, and that is when it all started! I bounced around on ponies through pony club, moved to eventing & then focused on dressage and was lucky enough to ride for UK U21s & BDYRS. Then moving to my latest steed, Zafiro LXXIII he is an 11 year old PRE Gelding. We have been together for 7 years, we rebroke him as 4 year old after a troubled start & he is now competing at BD Medium, moving towards advanced medium next year! Most recently crowned Elementary Open & Medium Restricted Champion with IDG Dressage Group, and won the IDG Elementary league & 2nd in the Medium. Other accolades to his name are the Champion Gelding at RWHS in 2013 & 2014. GBPRE Champion Gelding 2012, 2013 and reserve Champion in 2014. Qualification for BD breed championships & area festivals. We have had a long journey, but he is worth it! My beautiful 濾 unicorn, dancing like a warm blood in disguise! 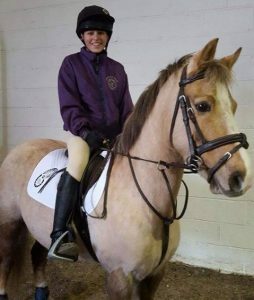 Hi, my name is Italia Jackson, I am 14 years old and I am a member of the Pony Club. 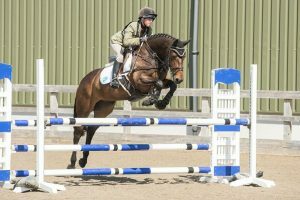 I compete in both affiliated and unaffiliated showjumping with my pony Finn, who absolutely loves to jump. I have owned Finn for almost 2 years and he is the pony of a lifetime. Finn is a 7yr old Irish sports pony who always puts his heart and soul into everything. I have big hopes for 2018 and I am so happy to have been given this amazing opportunity. I have 3 showjumping ponies one 138 & two 148s. I got my 138 spike for my 13th birthday , this was a big step for me as I had only been riding a riding school pony for a year beforehand so to go from a riding school pony to a top Grand Prix Pony was a pretty crazy thing to do but it was probably the best decision me and my family made as spike has completely changed our lives, he has taught me the world! It was a rough road with spike at the beginning because he’s not an easy ride but summer 2016 was when we clicked. From then on we competed in HOYS qualifiers where we just missed out and also competed in HICKSTEAD qualifiers where we missed out by one, coming first reserve. Summer 2017 me and spike qualified for Liverpool International for the 138 final in the end of December which is where the top 22 riders in the country compete against each other. Easter 2017 I got midnight my first 148, we have competed in newcomers,Fox,Members and Pony showjumper of the year which is 1m35/40 I would love to do European shows with mid! We then decided it would be nice to get a youngster so we bought stag , he has had a bad past so we are currently bringing him on nicely to get his confidence back and hope to produce him. I work so hard to keep my ponies up to scratch and without the help and support of my family, friends & sponsors it wouldn’t be possible. 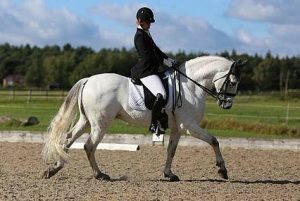 I am a 15 year old Dressage rider based in Surrey. I am riding/competing Rupert(Biagotte) and Magic(Majestas). Rupert(Biagotte) a 17.1hh Kwpn – Magic(Majestas) a 16hh ex racehorse – Star(whw Morning Star) 13.2hh rescue pony – Yogi (Starbuck yogi bear) 15hh Arab x welsh cob. I am competing Magic up to Elementary, I am aiming to produce him up to Medium. Rupert has only been with me for a few months so I am hoping to start competing him in February. I am aiming to produce him up to PSG. 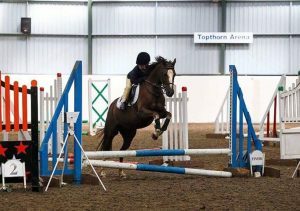 My names Hollie and I’m a 14 y/o Eventer from the South East. 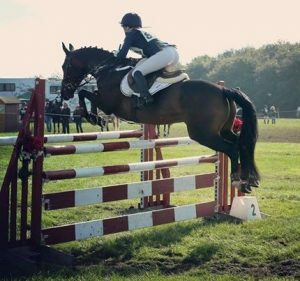 I compete my 14.2 pony Smartie currently at BE90 – which we have qualified to compete at Badminton Grassroots 2018 but after this event I hope to move up to 100 towards the end of the season. Over this winter we have been arena eventing and showjumping NSEA which has been just as successful but I’m extremely excited to get back out eventing in 2018! Steve is full time farrier based in Leicestershire, who alongside running this business, also produces a team of event horses. Over the last 10 years he has produced two horses from just backed, cheeky youngsters through to Advanced level. Working with his partner Teresa, they have also produced horses which have gone on to be integral members of other people’s strings including Whitney B, Investment, A Little Bit Bendy, Nigrasine Rain and Iceman. Whilst a long haul project, his passion lies with producing his horses from scratch, so sources 3 or 4 year old’s which are selected on their movement and jumping ability. 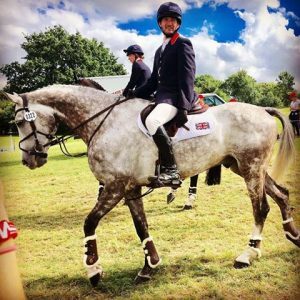 The highlight of his Eventing career so far was to achieve the lifelong dream of representing his county, and proudly wore the Union flag representing Team GB at last year’s 2* European Championship – bringing home a converted team silver medal! 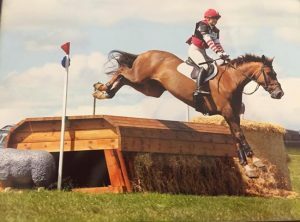 Steve and his team of horses relocated recently to be based at the fabulous facility Stonehouse Farm in Packington, Leicestershire boasting an indoor school, jumping arena, 20mx60m dressage arena, miles of off road hacking and xc schooling fences. 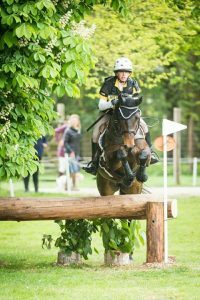 With new goals set, including riding for owners for the first time, 3* runs and an eye on returning to the Burghley Young Event Horses finals, 2018 looks set to be an exciting year. My name is Jasmine Gill and I’m 20years old. I currently have two of my own horses which I compete British showjumping with along side a few others that I compete for other people. Roundthorn Firebrand (Boris) is a 7yr old ish who we only backed last year as he was so naughty  he’s an exciting horse for me as he’s proving to be super talented in the ring. He has qualified for the bluechip finals in April and has all his British novice and discovery double clears for second rounds this year. He has just stepped up to jumping newcomers level. Haitie vant klavertje vier (Heti) is a 10yo Belgian warmblood who I’ve had for 4 years now. 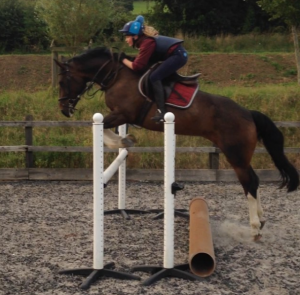 In that time she has taken me from jumping 90cm to 1.30m level and has won me so much. Shes won at bluechip championships , mill street in Ireland , and also helped me to win a very fast Welsh masters final. Heti is now just coming back into full work after a break and will be getting out to some bluechip qualifiers in hope that she also qualifies for the finals in April. Boris will continue getting to shows and jumping at newcomers level and will be aiming to do well in the second rounds which qualifies you for the nationals. 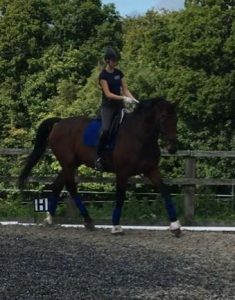 I am a 19 year old 2* event rider, I currently have a 10 year old mare who I have produced through the levels from a 6 year old along with her I have a 4 year old who will start his eventing career this season and a 3 year old Home bred who will begin his backing and training this year! After a very successful 2017 season including finishing 6th in the 1* at Great Witchingham earlier on in the year, many placing at intermediate level and coming 6th at eland lodge in the novice regional final meaning that I had qualified for the festival of British evening championships at both novice and intermediate, competing there for the first time which was a great experience and completing our first 2* also qualifying for the British dressage winter regionals at novice and elementary! We are very excited to see what this year brings with lots of aims and goals in reach of being achieved I am very thankful to have Muddy-Footprints  to support us this season and I am very excited to work with them! I’m 22 from Derbyshire. I started off with show ponies and trying out all different disciplines and showjumping was the way forward for me! I’m currently producing horses from just broken 3/4yos up to 1.45 level. The aim is produce horses the best I can and to the highest level I can. I am very much looking forward to working with Muddy-Footprints and seeing what the future brings. Next PostNext Sponsorship – Advice / Opinions ?